← Selfish People and Selfish Trees? 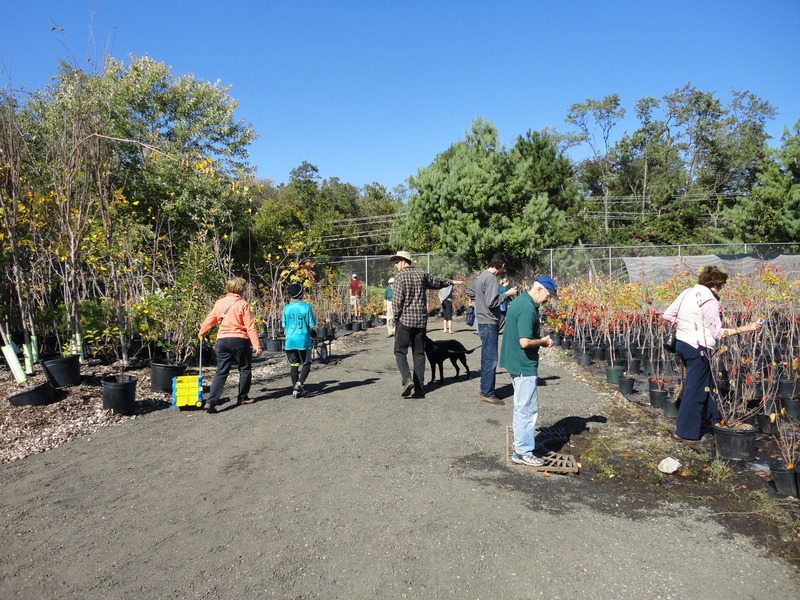 The Arlington Tree Distribution was held the weekend of October 15 and 16 at the county nursery and it was incredibly successful! 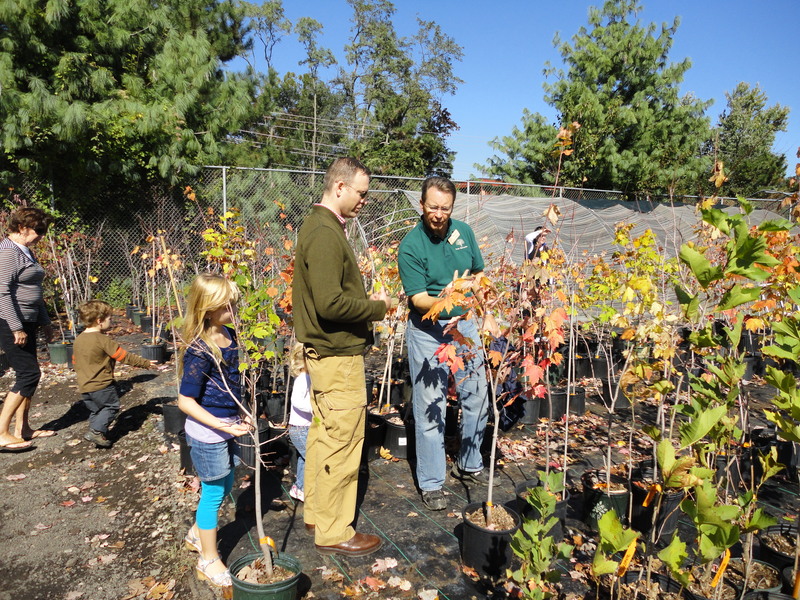 Over 500 households picked up trees for themselves and neighbors, and 26 Condos or Home Owners Associations picked up trees to plant in their common greens. The next Friday, an additional 300 trees were distributed. At least 1200 trees were adoptied, with about half smaller understory trees and half large canopy trees. The truly fantastic part was the education TreeStewards were able to provide. 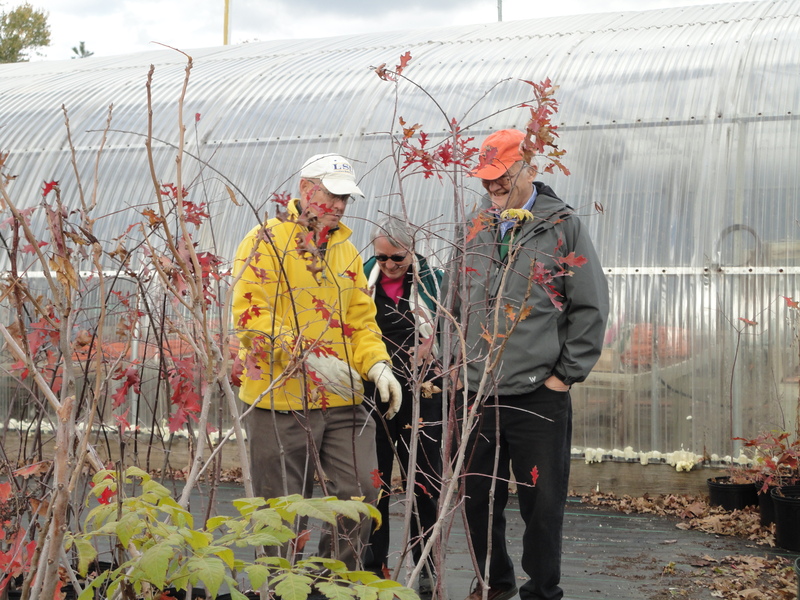 Every single person discussed their tree choice with one of the 14 TreeSteward volunteers, received planting instructions and a copy of the Tree Owner’s Manual (Available on the Tree Care tab of our site). It was wonderful to see so many families, and the children loved helping to pick the best tree for their yard – and they all promised to water and care for it over the years. There was incredible diversity of the adopters:they mirrored Arlington county’s diverse population with apartment dwellers on Four Mile Run seeing the event signs and coming with the manager to select a tree to put in front of the building, those watching softball in the fields in front came back and were provided education. Several canines came with their owners, but they were not allowed to “mark” their own tree! Patrick Wegeng, Environmental Landscape Supervisor of the Parks and Natural Resources Division was in his element talking with county residents. He not only provided education on how to choose the right tree for the right spot to the homeowners, but he oversaw the transportation logistics of getting the chosen trees to the parking lot. Landscape and Forestry Supervisor Jamie Bartalon coordianted county staffing, obtained educational materials for our use and pitched in during the rush of Saturday morning to keep the check in line moving. Virginia Extension Office was represented by Kirsten Buhls who brought educational flyers and provided individual expert advice to homeowners. TreeStewards who assisted with one on one education were: Don Walsh, Nora Palmatier, Steve Campbell, Bill Anhut, Lois Barb, Christina Campbell, Karen DeCarlo, Rich Fortwengler, John Wingard, Emily Ferguson, Jim Hurley, John Bottum, Barbara Monfort and Ollie Flint who came from Alexandria even though he didn’t get a tree. All together, TreeStewards volunteered more than 155 hours service in planning and implementing the event, which if valued at 2010 Virginia Average Hourly Value of Volunteer Time is $3,414.65. I think all of us felt it was the best educational event we’ve assisted and that we were making a difference in the canopy of our area. It was a great event and we look forward to next fall’s Arlington County Tree Distribution. This entry was posted in Advocacy, Community Service, Education and tagged Arlington, free trees, planting, tree care. Bookmark the permalink.